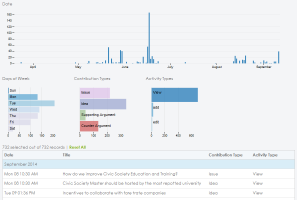 The Collective Intelligence Dashboard (CIDashboard) is a place in which analytics on conversational and social dynamics can be made visible and fed back to the community for further awareness and reflection on the state and outcomes of a public debate. This site allows you to choose individual visualisations or compilations of visualisations as a custom dashboard that can be embedded as an iframe or linked to as a full page from your platform. CIDashboard uses your data passed to us in the Catalyst Interchange Format (CIF). The above field is where you paste a url which must return jsonld formatted to the Catalyst Interchange Format (CIF). The system will then use this data to draw the visualisations you select. Each visualisation has dependencies on the presence of certain data elements in the data you supply us. 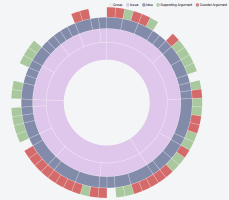 Please check your data matches the dependencies for the visualisation you select. Note: We cache your data temporarily to speed up displays and we therefore request that you also indicate how often we should refresh our cached data from your given url in the next field. The default is 60 seconds. If you wish to override the terminology used in the visualisations for the node and link type names to make it more specific to your platform and users, you can supply a url that expresses their replacement names. You can find specific details on the structure of this json file on the Help page. If you wish to display user names, descriptions or homepage links in any of the visualisations you select that require them, but you do not wish that data to be cached or stored on a server, you can optionally supply a separate url to get that data. The user url is only called and displayed by the browser and never the server, so that user data is not stored on any server. The user data must be supplied in CIF format containing CIF Agent objects with ids that match those supplied in the visualisation data given in the url above. 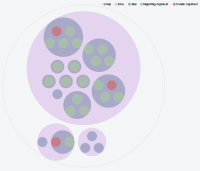 This visualisation shows a Conversation nested inside circles. The colours denote the node types. Dependencies: This requires nodes and connections or interconnected posts. 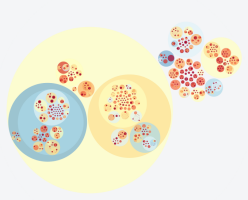 This visualisation shows a Conversation nested inside circles with colors denoting attention distribution across the contributions. Dependencies: This requires node and connection data. This visualisation display a network graph of the connected nodes in the Conversation as a layered sunburst coloured by branch of the Conversation. This visualisation display a network graph of the connected nodes in the Conversation as a layered sunburst coloured by node type. 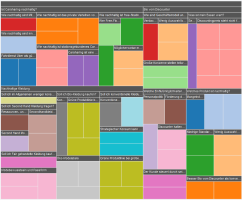 This visualisation displays a treemap of the Conversation. The colours of the squares change to represent sibling groupings. This version of the treemap is good for shallower trees. This visualisation displays a treemap of the Conversation. The colours of the squares change to represent node types.. This version of the treemap is good for shallower trees. This visualisation displays a tree of the Conversation. The node circle and link sizes are determined by the number of children below a given node. This visualisation displays a tree of the Conversation. The node and link sizes are determined by the number of posts below a given node. Dependencies: This requires nodes and connections and posts associated with nodes. 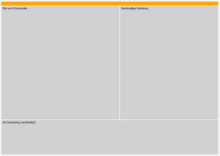 This visualisation displays a treemap of the Conversation. The first two levels of the tree are exposed initially and then you drill down by clicking the labelled boxes. This version of the treemap is good for deeper trees. This visualisation displays a treemap of the Conversation. The first two levels of the tree are exposed initially and then you drill down by clicking the labelled boxes. The box colour indicate the node type. This version of the treemap is good for deeper trees. 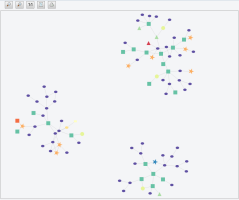 This visualisation display a social graph based on a given network graph. Dependencies: This requires nodes, connections and node authors or interconnectde posts with authors. 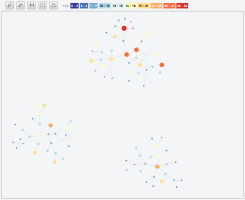 This visualisation display a network graph of the connected nodes in the Conversation showing the community interest in that node by ball size and colour changes. Dependencies: This minimally requires user, node and connection data. This visualisation display a network graph of the connected nodes in the Conversation. It shows sub-community clustering within the Conversation where the shapes representing the nodes change shape and colour depending on their sub-community. 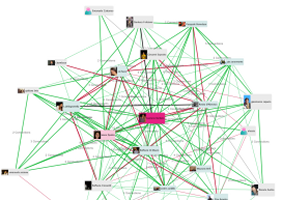 This visualisation shows a social network based on the conversation data supplied. Dependencies: This requires user, node, connection data. This visualisation shows creation and voting activity by participant. Dependencies: This requires nodes and user data with creation and/or voting activity data. This visualisation shows the activity of a Conversation over time. Dependencies: This requires activity data. 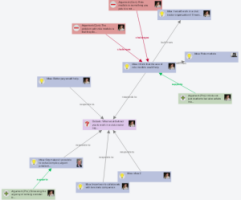 This visualisations provides an overview of important aspects of a Conversation. 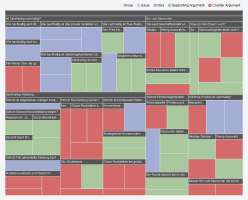 This visualisation show people and issues, letting you explore who added what kinds if items to which issues. This visualisations shows item creation over time for the various item types. This visualisation clusters contributions based on similar activity patterns. Dependencies: This requires voting data. 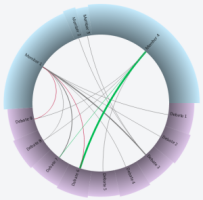 This visualisation clusters contributions based on similar voting patterns. Dependencies: This requires history data. If you wish to embed a whole dashboard of visualisations rather than individual ones, you can use can organise your dashboard embeddable here. NOTE: The CIF data you provde us in the visualisatoin data url above is used to draw all the dashboard visualisations you select, therefore it must contain all the dependent data required by each selected visualisation. You select visualisations for your dashboard by ticking the 'Use in Dashboard' checkboxes on visualisations in the preceding tabs. 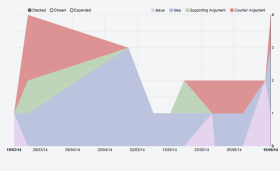 This mini visualisation displays a bar chart of contributins by node type and optinally votes. Dependencies: This requires nodes or posts with author data and optionally votes. 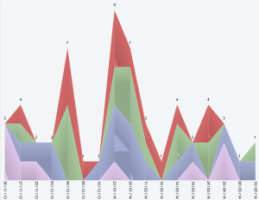 This mini visualisation displays a sparkline graph of user viewing statisitcs. Dependencies: This requires nodes or posts with author data and their viewing history. This mini visualisation displays a traffic light indicating participation health. Dependencies: This requires nodes or posts with author data. This mini visualisation displays a traffic light indicating Viewing activity health. 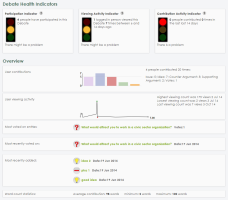 This mini visualisation displays a traffic light indicating contribution activity health. Dependencies: This requires nodes or posts with author and creation date data. This mini visualisation displays word count statisitcs. Below is an area to configure your dashboard embedable or link. 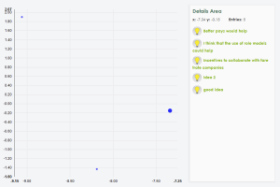 You must choose the visualisations to include in your dashboard from the Mini Visualisations list above using the 'Use in Dashboard' checkboxes. These will then appear in the panel below. The above field is where you paste a url which must return jsonld formatted to the Catalyst Interchange Format (CIF). The system will then use this data to process for alerts you select. Dependencies: These require minimally nodes or posts with author data. But ideally also connections, votes and views data. This embeddable displays alerts. Please select which alert types you would like messages shown for in this alert box from the list on the right. Below you can also specify a list of user ids to get alerts for. 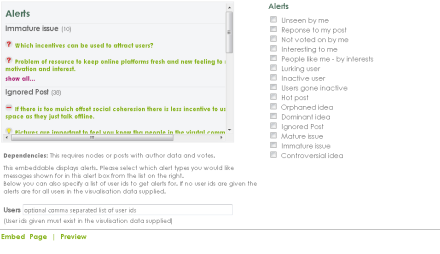 If no user ids are given the alerts are for all users in the visualisation data supplied. 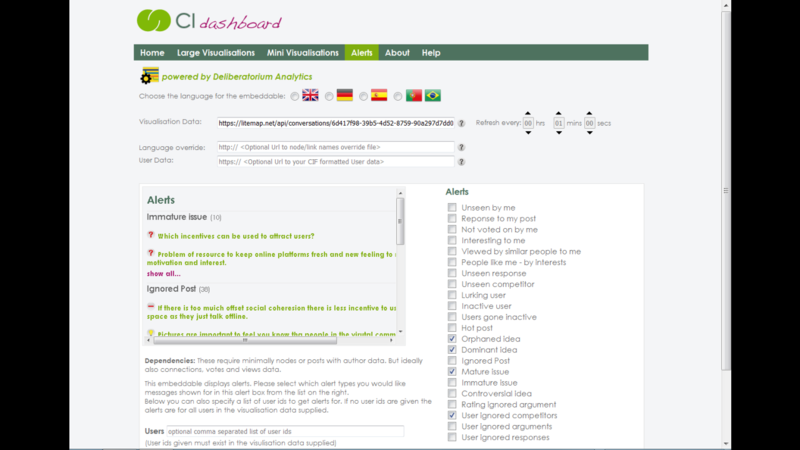 The Collective Intelligence Dashboard (CI dashboard) is an open online service that provides analytics visualisations for online debate platforms. It is a place in which analytics on conversational and social dynamics can be made visible and fed back to the community for further awareness and reflection on the state and outcomes of an online debate. 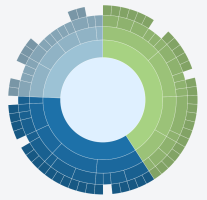 This site gives an overview of all analytics visualisations we provide, allows to view them individually with demo and own data, to assemble a custom dashboard of visualisations, and provides the information necessary to embed the visualisations or the custom dashboard into other online debate platforms. The CI Dashboard comes from research on Contested Collective Intelligence carried out by the IDea group from the Knowledge Media Institute. Participants are rarely aware of other people's contributions before they contribute to the debate (this also leads to poorly informed contribution and idea duplication). These issues informed the choice of visualisations, analytics and alerts that you will find on this website. It is our aim to provide 'embeddables' that improve informed participation and the quality of contributions in an online debate site that uses them. 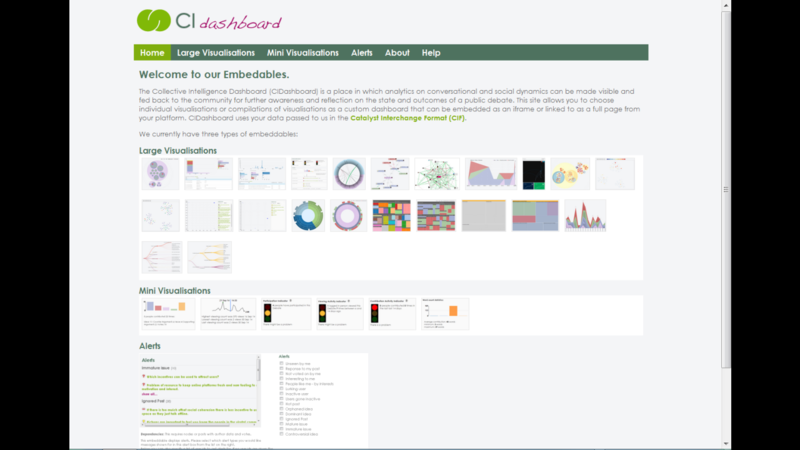 The Collective Intelligence dashboard (CI dashboard) is a analytics visualisation service provider for other online discussion and Collective Intelligence platform providers, such as for instance Assembl - a large scale co-production system, DebateHub - a hub for structured debates, or LiteMap - a debate mapping tool. The communication between the analytics visualisation provider and the platforms is based on a standardised data format - the CATALYST Interchange format Catalyst Interchange Format (CIF). The CIF format is modelled in terms of RDF and is serialised as JSON-LD. It provides a standardised description of online conversations. 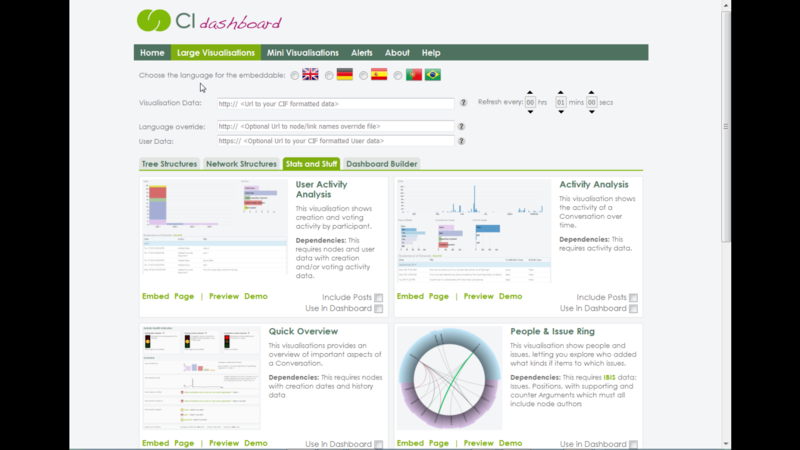 The CI dashboard uses the CIF data either directly to generate visualisations, or it requests CI statistics from the CATALYST metric service. This services calculates CI specific metrics from the CIF data and provides these to the CI dashboard. 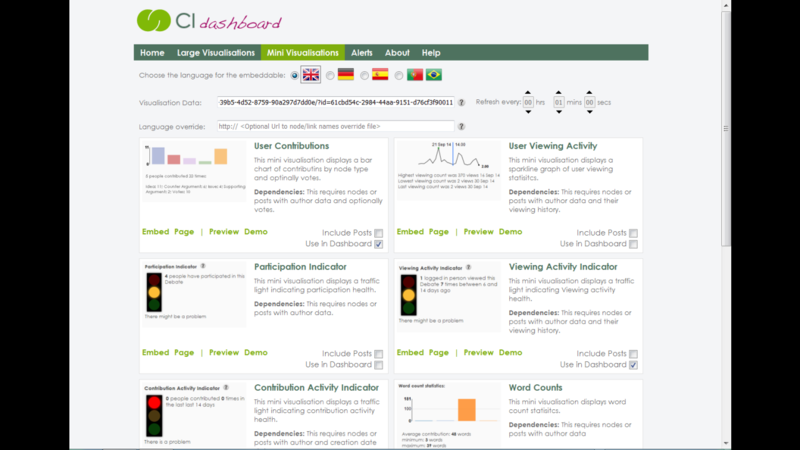 CI Dashboard Design, Development and Testing was undertaken as part of the Catalyst Project by the Knowledge Media Institute team (Anna De Liddo and Michelle Bachler). We are also indebted to Harriett Cornish for graphic design. This help page will describe the large visualisation embed urls and their parameters and show some examples of use. You will notice that the src url for the iframe and the url for the full page link are basically the same. Though strictly speaking the full page link url does not require the width and height parameters, they are there because the url creation for both in centralised. timeout (optional - default is 60) Number of seconds to cache the visualisation CIF data for on our server. 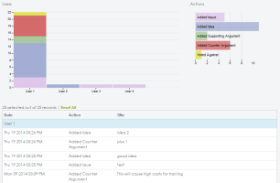 vis (compulsory) This string indicates which visualisations you have selected for your dashboard as well as the order they are to be displayed. It is a comma separate string of the large visualisation ID numbers, as given in the Large Visualisations table above. Some of the visualisation ID numbers can have a letter after them. The letter p before an ID number denotes you wish to include posts (withposts) for that visualisation (see the Large visualisation table above for which visualisations this applies to). For the Edgesense visualisation you can also have c before its ID number to denote you want the network only. title (optional) Title - a title for your dashboard. This help page will describe the mini visualisation embed urls and their parameters and show some examples of use. You will notice that the src url for the iframe and the url for the full page link are basically the same. 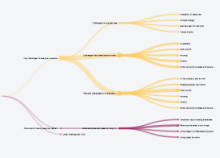 vis (compulsory) This string indicates which visualisations you have selected for your dashboard as well as the order they are to be displayed. It is a comma separate string of the large visualisation ID numbers, as given in the Large Visualisations table above. Some of the visualisation ID numbers can have a letter after them. The letter p before an ID number denotes you wish to include posts (withposts) for that visualisation). userids (optional) This string indicates which users you want to generate alerts for. It is a comma separated list of the user ids as found in the Visualisation data supplied in the url parameter. alerts (compulsory) This string indicates which alerts you have selected. It is a comma separate string of the large alerts ID numbers, as given in the alerts table above. The Catalyst Interchange Format (CIF) is a jsonld schema for representing conversational data from online forums, debating tools and dialogue mapping websites. Most Collective Intelligence tools allow organising concepts in some sort of structure that reflects the conversation back to the participants (a concept map in the very broadest sense). The core of this specification is a Data Model to represent the following in a systems-independent way while preserving as much semantics as practical:"
The type and amount of structure can vary greatly between systems, but we believe there are some useful levels of "shared semantics" that are achievable relatively easily. The first and most basic level is sharing the raw structure of the concept map (nodes, edges) with very basic information (such as node title). This allows several visualisation tools to be applied, as well as a significant number of metrics. So, to leverage the visualisations and analytics we provide, the more detailed CIf you can provide us the better the results you will get. 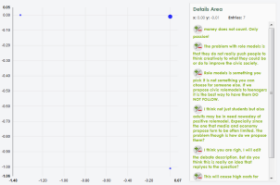 But even with very simple forum post trees there are many visualisations and alerts you can access. The following terms can be overridden in the visualisation interfaces by providing a url to a json file containing the overrides which you place in the 'Language override' field. You can override all or only some of the terms. 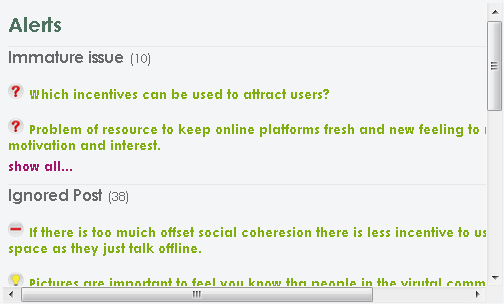 Link labels are currently only used on the 'Conversation Network' visualisation. Below is an example of the expected structure of the json file. Remember you don't need to include all the terms, only those that you want to override. If you wish to display user names, descriptions or homepage links in any of the visualisations you select that require them, but you do not wish that data to be cached or stored on a server, you can optionally supply a separate url to get that data. The user url is only called and displayed by the browser and never the server, so that user data is not stored on any server. The user data must be supplied in Catalyst Interchange Format (CIF) containing CIF Agent objects with Agent "@id" parameters that match those supplied in the visualisation CIF data you give us. "fname": "Michelle Bachler - Yahoo"